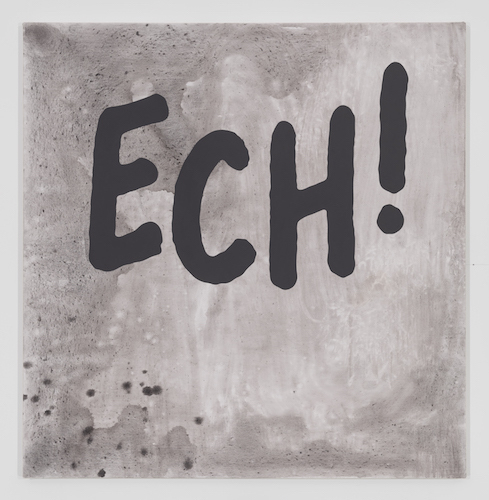 Carl Ostendarp, ECH!, 2016, acrylic on canvas, 52 1/2 x 51". Well known for his minimalist approach to cartoony graphics and text, Carl Ostendarp’s hand-painted work harkens back to the early days of Pop. For his first show at this gallery’s new location, he employs a tool associated with blue-collar labor to make the washed-out, earth-tone-gray backgrounds of his paintings: a mop. The result is an abstract surface that resembles a cosmic soup, or an eruption of lava, possibly signifying a return to the primordial—or the end of the world. Two types of acrylic-on-canvas work are present: long horizontal landscapes and word paintings. Unifying the first group is a craggy horizon line filled in with an opaque gray that could be read as a series of upside-down drips or a mountain range. Titled after classic Black Sabbath tracks, works such as Behind the Wall of Sleep and Hole in the Sky (all works cited, 2016), with their hazy backdrops, are perfect symbols for our uncertain future. The word paintings, consisting of onomatopoeia favored by comic-book artists—Mad magazine’s Don Martin comes to mind—represent what one utters when reading a daily barrage of disheartening news about the Trump administration. These guttural, gloomy renditions—two of which are titled Ech! and Agh! Argh! Ack! Gak!—would make great protest signs. (Auspiciously, the international Women’s Marches were held on the same day that the gallery opened this exhibition.) Ostendarp skillfully crystallizes the mood of our collective spirit in this grouping of works—totally nauseated.